The basic recipe here is for the French classic quiche Lorraine, which is little more than eggs and bacon baked in a pie crust. The variations — many of which rely on frozen vegetables, making this a good dish for wintertime meals — build on this template. Most quiche recipes call for blind-baking the crust before a second bake with the filling. But I prefer to treat this dish as what it is — a custard pie — and simply roll out the chilled crust, put it into a tart pan, arrange the filling on top, and bake. The results are delicious, and the total time is briefer. You can use a standard 9-inch pie plate if you don't have a 10-inch or 11-inch fluted tart pan, but you'll probably have both extra dough and extra filling left over. Besides, the quiche will both bake faster and look prettier if you use the tart pan. This recipe is easily doubled, something you'll want to do if you're feeding a crowd for dinner. Break the work in half by prepping the dough (and the filling, if you like) a day ahead of time. Make the crust dough: Put the flour, salt, and sugar in the bowl of a food processor and pulse a few times to mix. Add the cubed butter and pulse until the mixture looks like breadcrumbs. (You can also do this by hand with your fingers, but the food processor is faster and produces a more even result.) Remove to a medium bowl. Mix the egg with a couple of teaspoons of the ice water. Add the watered egg to the dry ingredients, mixing it in with a fork. Continue adding cold water, a few teaspoons at a time, sprinkling it over the dough and mixing it in with your hands, until the dough starts to come together, then finish patting the dough together into a ball. Wrap the dough in plastic wrap, press it into a disk, and chill it for at least 30 minutes (or freeze it for 10 minutes) before rolling it out. Make the filling: While the crust is chilling, cook the diced bacon (if using) until crisp. Drain off the bacon fat and reserve it for another use. Mix together the eggs, cream or half-and-half, salt, pepper, and nutmeg (if using). Assemble the quiche: Butter a 10-inch or 11-inch fluted tart pan. Roll out the crust, then put it into the pan, folding it under so the crust is even along the edge of the pan. Scatter the cooked bacon (or cubed cooked ham, if using that instead) evenly across the surface of the crust dough, then pour the egg mixture over it. You can replace up to half of the flour with whole-wheat pastry flour. And if you have crème fraîche on hand, follow Anne Willan's suggestion in The Country Cooking of France and use that as the dairy base, thinned with cream or milk. h4. Variations You can add pretty much any filling combo you like to the egg-dairy base of this quiche, which means the recipe is a good way to use up small amounts of leftovers. Try fresh asparagus spears arranged in a circle, or sliced and sautéed leeks, or bits of sausage and roasted potato. Freshly grated Parmesan or Gruyère cheese scattered across the top of any quiche just before or after baking is nice, too. Spinach Quiche: Dice 1/2 medium onion and sauté it in a little oil or butter with a minced garlic clove or two. Add it to the egg filling along with 5 ounces spinach (freshly steamed, from either fresh or frozen spinach leaves). 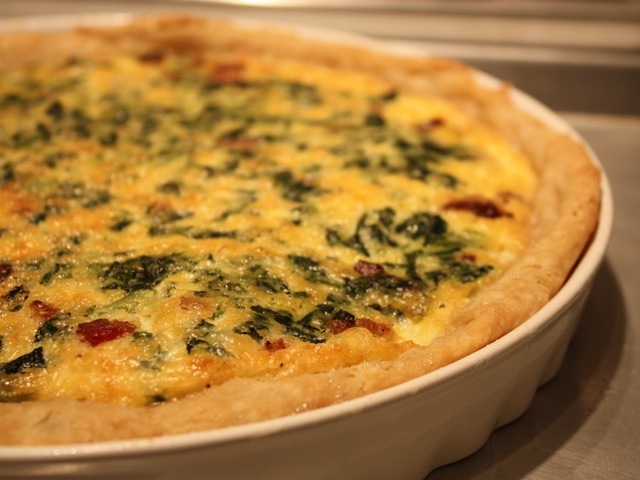 Spinach and Bacon Quiche: Skip the onion-and-garlic step in Spinach Quiche, above. Use half of the bacon called for in the master quiche recipe. Mushroom Quiche: Dice 1/2 medium onion and sauté it in a little oil or butter along with 5 ounces sliced mushrooms and a minced garlic clove or two. Add it to the egg filling. Broccoli and Cheddar Quiche: Dice 1/2 medium onion and sauté it in a little oil or butter with a minced garlic clove or two. Add it to the egg filling along with 1 cup shredded Cheddar cheese and 5 ounces defrosted broccoli florets, cut smaller if you wish with kitchen shears.